UK born Lady Margaret Turnbull, the owner of Lawler’s Loft bed and breakfast, in the sleepy village of Bangalow, Australia is surprised that Detective Tom Sullivan has brought her a birthday gift. But both are completely dumbfounded when they open the box and discover a jar with a severed finger wearing an expensive engagement ring. Detective Tom Sullivan is completely clueless as to why his aunt would send him such a gift. 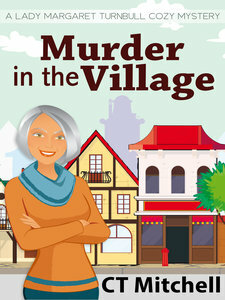 But village busy body and part time, amateur woman sleuth Maggie Turnbull has other ideas, which to the annoyance of Detective Sullivan are usually right. “We have a finger; now we must find a body it was attached to” is Maggie Turnbull’s line of thought as she untangles a web of broken hearts, lies and secrets in order to catch a serial killer. He’s already killed 3 times; will Lady Margaret be able to prevent the 4th? Mystery novel Australian crime fiction author C T Mitchell masterfully creates a feast of twists and turns in this international cozy mysteries series that will keep the pages turning. You won’t be able to put your finger on the murderer until the end in this short story novella from a sleepy village Down Under.